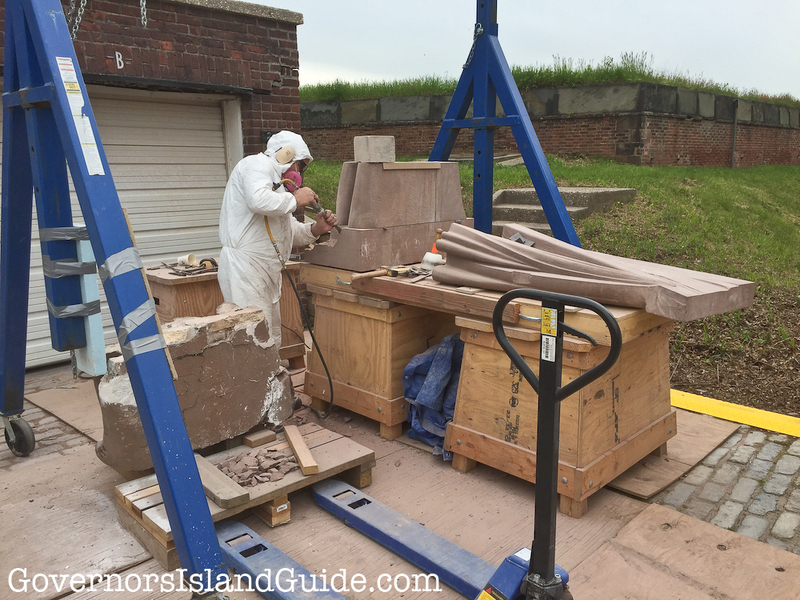 The Eagle Sculpture restoration at Fort Jay, May 17, 2016. 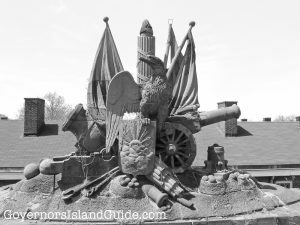 On Tuesday I was able to get a sneak peek inside Fort Jay at the restoration work ongoing by the National Park Service to repair the Eagle Sculpture. This is the large sculpture from the 1790s, made of sandstone by an unknown artist, that is above the fort’s sallyport. It was damaged during Hurricane Sandy in 2012. Michael Shaver, chief of interpretation of the Governors Island National Monument, led us. Ranger Shaver explained that funding for the storm repair is allowing for a master stone carver to replace and repair the pieces damaged in the storm. Currently the bottom of of the flags is being replaced. The “new” stone was acquired by the government through the Smithsonian and is being carved to replicate what was damaged. The scaffolding around the Eagle Sculpture will remain in place for the rest of the year, at the very least. After the storm-damage is repaired, a round of funding is going to be needed to return the sculpture to what it once looked like around 1903. Over the years many pieces have fallen off and been lost. I’ll write a longer post as the work moves along. It was thrilling to see the actual carving taking place back by the garages inside Fort Jay. This summer look up at the scaffolding, and hopefully soon the sculpture will be restored fully. Interested in Governors Island stories? 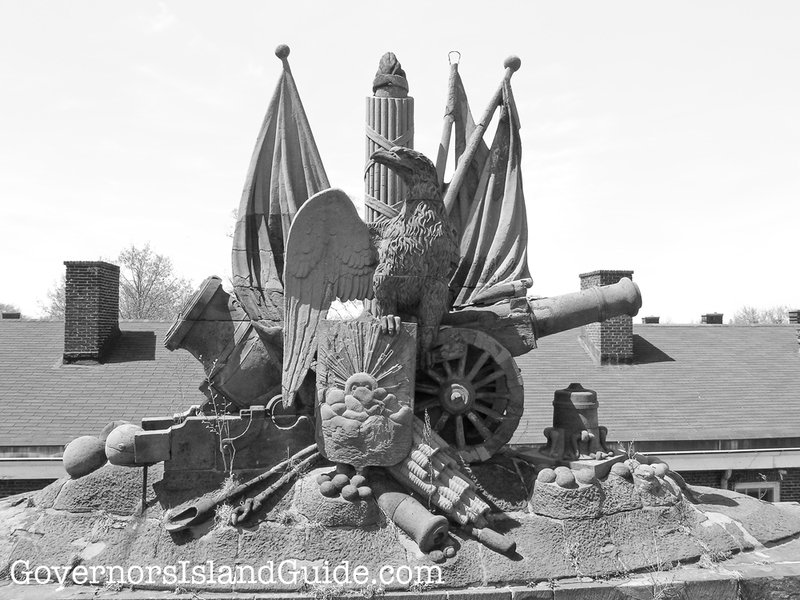 Pick up The Governors Island Explorer’s Guide (Globe Pequot Press). Available now online, and for sale in the Island bookstore at the ferry dock.